Check out our table full of items made by local folks to benefit the library. Besides the colorful array of hats, mitten, & scarves, you’ll find eyeglass & cellphone covers, shawls, and many other useful items. Thanks goes to the Blacksheep Handspinners Guild members who made wool mittens for the sale. Our thanks also to the Berkshire Reading Club, Evelyn Martin, LuAnn Whirl, & Jackie Jewett. A selection of books by our local authors is also available. 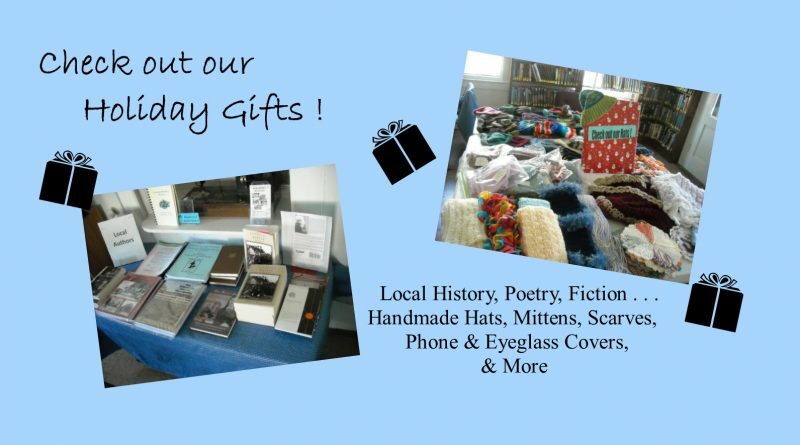 And remember to “Shop Local” at the many area businesses who have supported the library throughout the year.